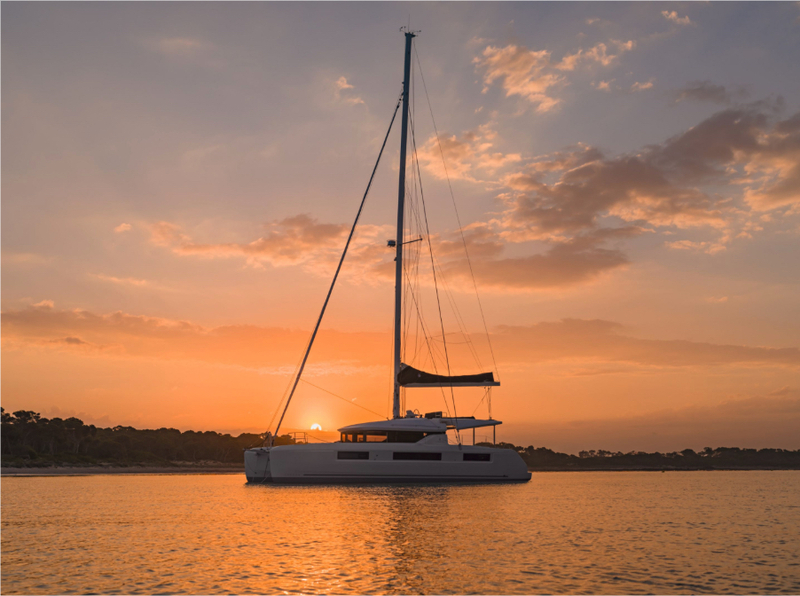 A new flagship sets the standard for luxury power catamarans. 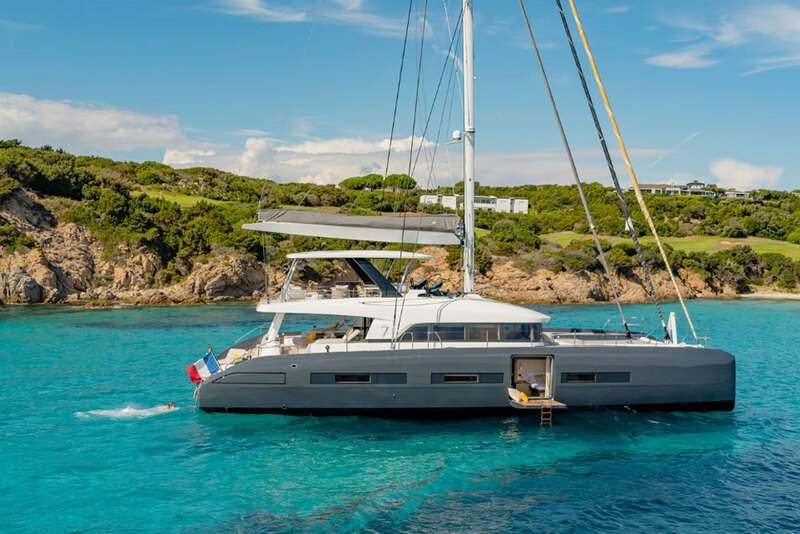 The new Lagoon 630 is the flagship of the French builder’s power catamaran line and she’s getting high praise from all who have sailed or even just seen her, and you can get a quick peek for yourself by watching our Lagoon 630 Motor Yacht First Look Video. She is a big cat. The aft deck alone is nearly 250 sq. ft. and the interior is 900 sq. ft. 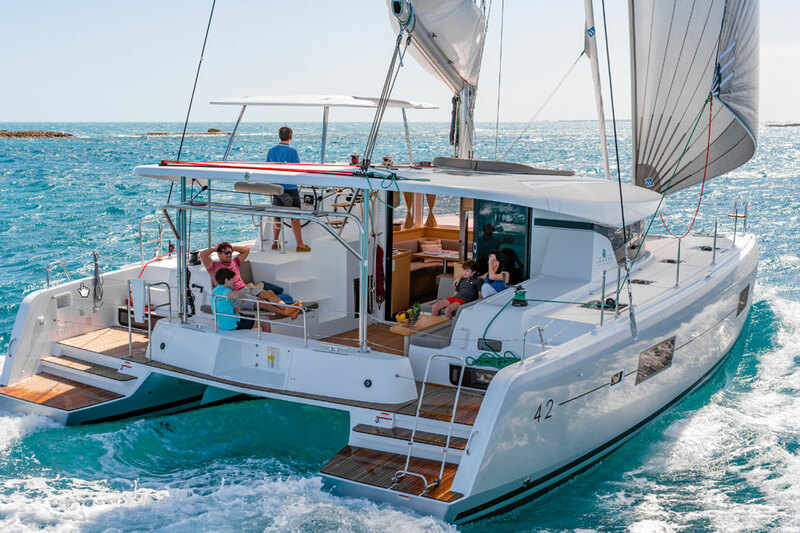 The 630 can easily accommodate up to 12 people for extended cruising but it’s not just her size that makes her noteworthy. With a nod to superyacht styling and elegance, the Lagoon 630 Motor Yacht sets a new bar for power catamarans. Naval architects Van Peteghem and Lauriot Prévost (VPLP) joined forces to draw the lines of the Lagoon 620 sailing cat of which over 50 hulls have been built so far. Realizing they had something special, the team then leveraged the design and transformed it into a motor yacht with luxurious accommodations and a good turn of speed. There’s more to creating a power cat than just taking the mast out of a sailboat, so the designers set about the task of reinforcing the model in order to withstand different kinds of forces. 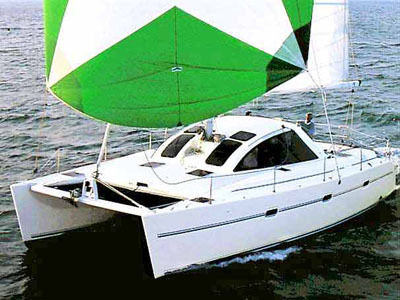 The aft 20 percent of the underbody was optimized to allow higher speeds and manage the pressure exerted on the hulls. Now two feet longer with reinforced compartments to hold larger engines, this Lagoon 630 cruises at 10 knots and there are very few places she can’t go. The elegant, contemporary interior is the work of Italian firm Nauta Design. Gone are the white composite surfaces cats have been known for. A more upscale feel has been created with Alpi reconstituted wood in oak or teak, paired with dark veneer flooring and leather and fabric-accented wall coverings. Indirect lighting is used strategically as well as with hatches and vertical hull windows. Electric blinds add privacy day or night. There are so many options to personalize the Lagoon 630 that it’s more of a semi-custom, rather than a production, boat. 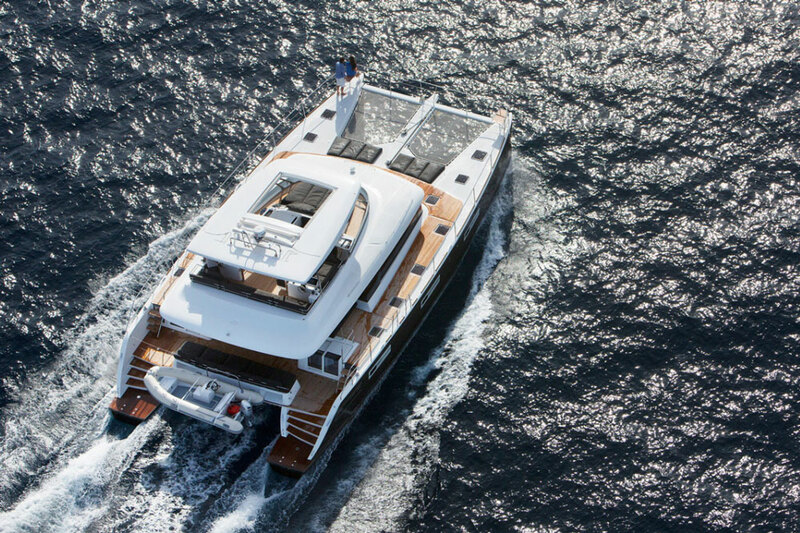 The Lagoon 630 may be ordered with up to six cabins, three in each hull. If the owner version is specified, that sumptuous master stateroom takes up half the starboard hull with a large athwartships berth. Aft is the owner’s head with twin sinks and a clear glass stand-up shower compartment. This cabin may be accessed from the saloon or directly from the aft deck. Other staterooms include three to four doubles and the option of one over/under cabin on the port side, which can be used as crew quarters. 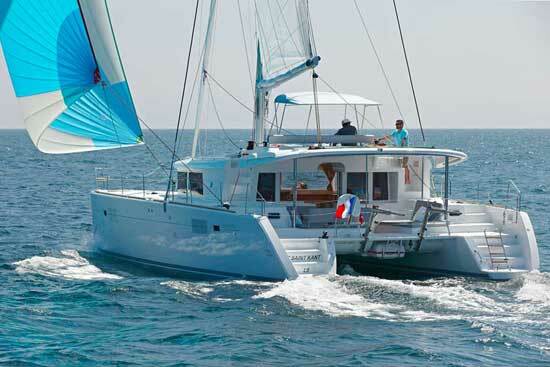 Owners with specific needs can also decide the location of the galley–up in the saloon or down in the port hull. The “galley up” version has the sink and stove outboard to port and a long island with lots of countertop space toward the center of the saloon. This island allows multiple cooks to work simultaneously, provides a place for extra stowage and refrigeration drawers below, and helps to serve as a bracing point for the chef to work safely. The lateral “galley down” configuration takes up the aft end of the port hull and has its own exit to the deck. If this vessel is professionally managed, the crew can prepare meals out of sight and serve guests inside or on deck with minimal intrusion. In this layout, the entire inside main deck becomes the saloon with large sofas facing inboard and low tables on both sides. 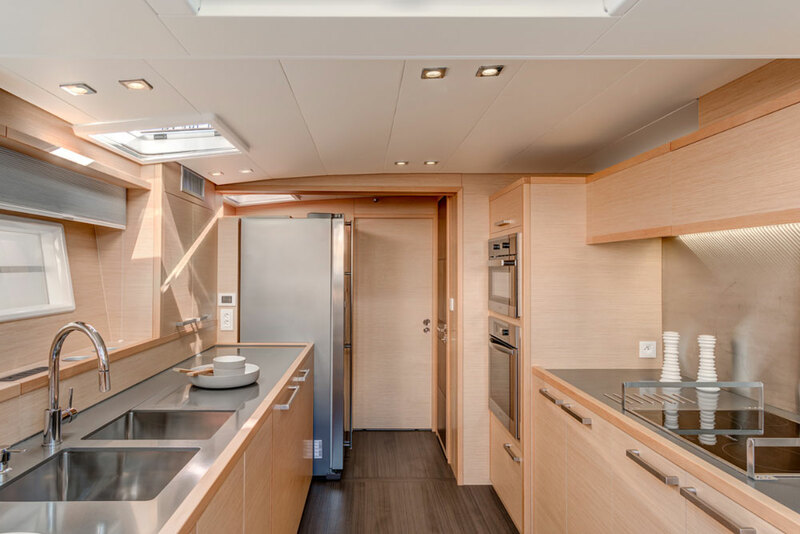 A full-sized refrigerator and oven and a double sink are a few of the perks chefs will enjoy, thanks to the spaciousness of the galley in the 630 Motor Yacht. On deck, nothing is difficult to negotiate on this cat. It’s easy to move forward on one level all the way to the sunpads on the foredeck. There are handholds along the cabin-top and a high stainless-steel railing around the perimeter of the deck. It’s also easy to board the aft swim steps from a dinghy or a dock. Then it’s just four steps to the main deck and into the cockpit. Although the saloon may be spec’d with two side-by-side dining tables, this model is really designed to have everyone dine al fresco in the cockpit where a large table to starboard seats eight. There’s a lounge just outboard of the dining settee and a wet bar may be installed in the long counter to port. Another exceptional feature that makes getting around easy is the full staircase—not a ladder—between the cockpit and the flybridge. The steps are easy on the knees and there are plenty of handholds along the way. The entire transom is one long settee with two integrated life raft cubbies below, and engine access is via deck hatches on either side. With the engines nearly 30’ apart it’s easy to maneuver this big boat in close quarters, but Lagoon did spec a bow thruster in the starboard hull for even better control. The standard engines are 260 HP Volvo D4 diesels (upgradeable to 300 HP) with V-drives and four-bladed props. At six knots with the standard engines, the maximum range is just over 2,900 nautical miles. A faster cruise of nine knots is possible and an optional fuel tank that holds nearly 500 additional gallons may be spec’d, making this cat an ocean-crosser. Unlike many other designs, the Lagoon 630 doesn’t chop up the flybridge but rather gives it a nice flow between leisure and working areas. An L-shaped settee to starboard allows guests to be separate from the crew working at the twin steering stations. The helm pods, each with instruments and an MFD, resemble command centers on a superyacht adding to the overall luxe feel of the boat. The hardtop has an optional retractable sunroof. For those wishing to work on their tan on the forward sunpad, a canvas shade slides back so that lounging on the upper deck feels like riding in a convertible. 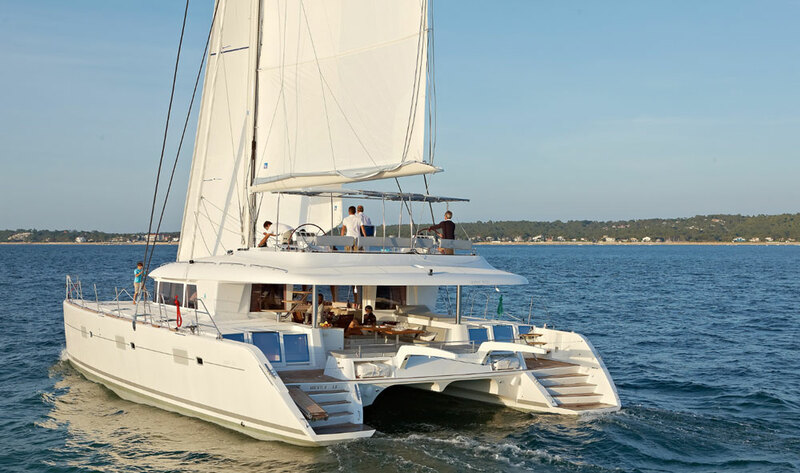 The power catamaran’s large open spaces, exceptional comfort, good stability and significant fuel efficiency make sense, and the continuing evolution of cats has added noticeable luxury, making some feel like superyachts. Following that trend, the Lagoon 630 is showing off what a power cat can be. 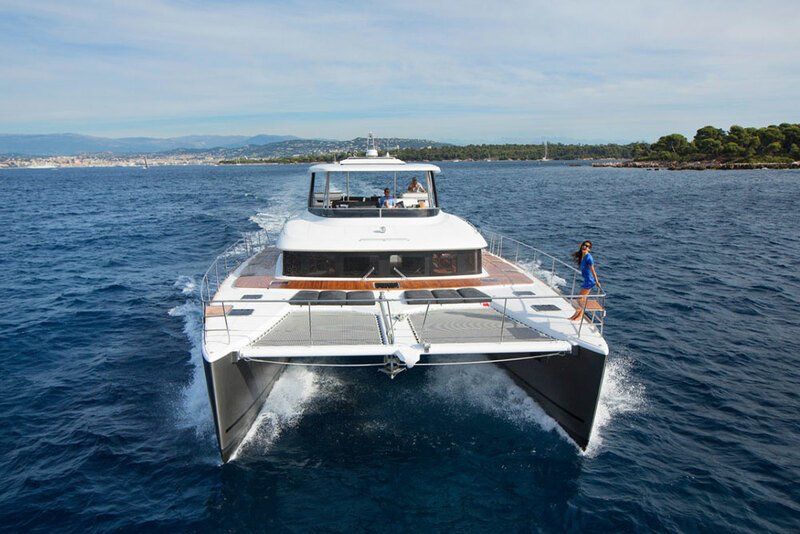 Other Choices: There aren’t many power catamarans in this class, but the Sunreef 60, powered by Volvo IPS800 pod drives, is similarly large and luxurious. A smaller, less expensive option would be the Horizon PC52. 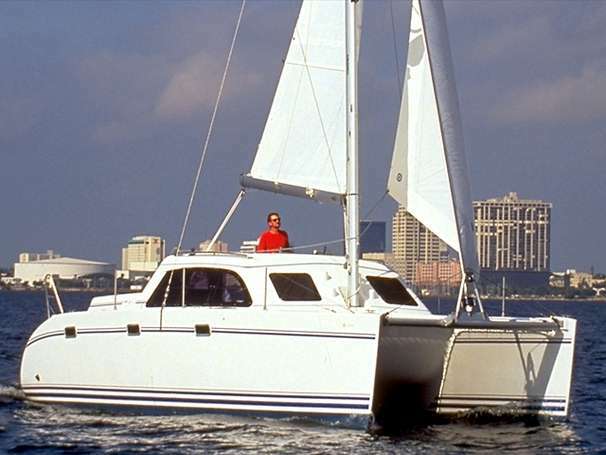 See Lagoon power catamaran listings.